There are a growing number of Mosques in Brazil, especially in the cities like Rio de Janeiro and Sao Pualo, to cater to the growing interest from Muslim tourist to visit the country. Brzail offers so much to do and see, that an opportunity to visit the country cannot just be passed up. Home to picture-perfect white-sand beaches, epic jungles, an incredible variety of fascinating wildlife, renowned waterfalls, and so much more, we think Brazil deserves a spot on every individual’s travel bucket list! Although Brazil houses a small population of Muslims, Islam in Brazil has a long history. When Africans were brought to the country as slaves, they brought with them their religion – Islam. Muslims from Arab countries such as Lebanon and Syria followed, and today they, along with reverts, make up Brazil’s Muslim population. While Muslim communities can be found throughout the country, some areas have a larger Muslim population than others, such as the states of São Paulo and Paraná. This means that Muslims will be able to locate more Muslim-friendly facilities such as masjids, and Halal restaurants in these areas. Muslim visitors are also sure to find at least one Halal restaurant in close proximity to a mosque. Today there about 151 mosques in Brazil, and the number is constantly growing. Muslim tourists will be able to find quite a number of mosques in São Paulo. The Islamic Center of Brazil, Masjid Abu Bakr Assiddik, Mesquita Salah Ad-Din Al Ayubi, Centro de Divulgacion do Islam da America Latina, Al Firdaus Masjid, Masjid Hanzala, Sociedade Beneficente Musulmana, and Masjid Hamza are just a few mosques in São Paulo frequented by the local Muslim community, and by tourists from around the world. The Islamic Center of Curitiba and the Mosque of Curitiba can both be found in Paraná’s capital, Curitiba. Muslim tourists will also be able to locate numerous other mosques across some of Brazil’s major cities. The large Omar Ibn Al-Khattab mosque has become a landmark in Foz do Iguaçu as it was inspired by the architecture of the Al Aqsa mosque. 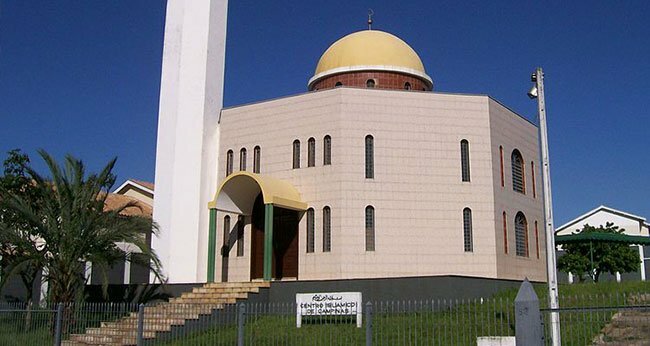 Muslims will also be able to offer their prayers at Brasilia’s Islamic Centre Mosque, the Mosques in Cuiabá, as well as the one in Belo Horizonte. Prayer facilities are also available at Centro Islamico de Campinas in Campinas, Cemitério Islâmico De Guarulhos in Guarulhos, Sociedade Beneficente Muçulmana in Rio de Janeiro, the Islamic Cultural Center of Bahia and Arab Islamic Cultural Beneficient Center in Salvador, Centero Islamico Do Amazonas in Manaus, Centro Islamico de Florianopolis in Florianopolis, Centro Islâmico de Porto Alegre in Porto Alegre, the Islamic Center of Ceará in Fortaleza, the Islamic Center of Recife in Recife, and at the Islamic Center of Natal in Natal. Details of these mosques, including addresses, contact details, facilities offered and more, can be found here. Find out more about the cities in Brazil, in our city guides section here.